Although widely distributed, occurrences are spotty, and this species has been eliminated from a large portion (> 50%) of its historic range, and is on many state endangered species lists as it continues to be threatened by habitat degradation, pollution, and invasive species. 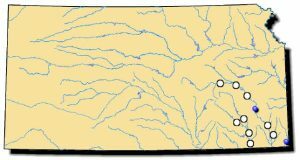 Historically, the rabbitsfoot occurred in the lower Great Lakes sub-basin and Mississippi River Basin from 137 streams in 15 states including: the lower Great Lakes sub-basin, Ohio River system, Cumberland River system, Tennessee River system, lower Mississippi River sub-basin, White River system, Arkansas River system, Red River system. Reports from Nebraska, Michigan, Iowa and New York are questionable at best. Rabbitsfoot populations are considered to be extant in 46 streams in 13 states including: lower Great Lakes sub-basin, Ohio River system, Cumberland River system, Tennessee River system, lower Mississippi River sub-basin, White River system, Arkansas River system, Red River system; in Alabama, Arkansas, Illinois, Indiana, Kansas, Kentucky, Louisiana, Mississippi, Ohio, Oklahoma, Pennsylvania, and Tennessee, and perhaps Virginia. Any historical occurrences in Georgia and West Virginia are now believed extirpated, while its continued existence in several other states (e.g., Alabama, Kansas, Louisiana, Mississippi, Missouri) is extremely perilous. Comments: The rabbitsfoot is named for its general shape. Its length is about three times longer than its height. The elongate, greenish-brown shell has a row of knobs and often exhibits a beautiful pattern of dark triangles. 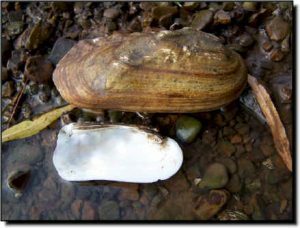 It is one of the rarest mussels in Kansas. It is found in clear streams with swift current flowing over stable gravel substrates. Specimens can be found in the Spring River and a short stretch of the mid-Neosho River. The Verdigris River currently contains chalky, long dead specimens only. However, surveys in Oklahoma recently discovered an extant population below Oologah Reservoir. So, propagating and reintroducing juveniles to sites upriver in Kansas remains a possibility to help recover this species.